I saw this bit of everyday poetry while on a hike last year, and felt like revisiting it. 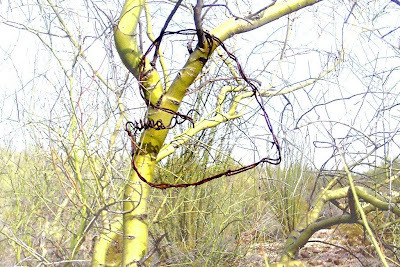 The barbed desert heart is still there, surrounded by the spring fall of yellow palos verdes blossom. I've begun work on a new sacred mask. I haven't made a sacred mask in years, although I've made a lot of commercial masks. "Sacred" is a word with lots of meanings, but to me it means making a mask through a process that is "In-vocational". Invoke comes from the same root as "yoke" and "yoga", to join with , unite. 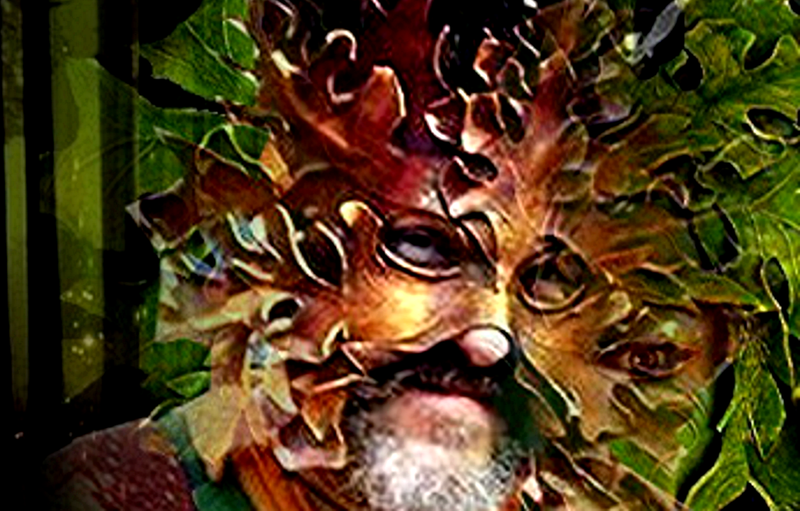 In my experience, when intent is given to create a sacred mask, it becomes an invitation and a prayer to the deity (ancestor, power animal, or for those who are uncomfortable with anything touching on religion or shamanism, "archetypal power") to enter this world. To interact with, inform, bless, and transform in some way, the maker, those who use the mask, and ultimately, the audience as well. This was well understood in indigenous cultures, where masks are regarded as power objects, and are not used lightly. But because we've lost so many of our shamanic/magical traditions, the idea is generally not understood in today's world. In my own experience, like in Kevin Costner's 1989 movie Field of Dreams, "If you build it, they will come". This mask may be the first of 21 masks for Prema Dasara and the "21 Praises to Tara", the beautiful Mandala Blessing Dance that she has been creating with groups of women for many years. It will be an honor to meet this dedicated spiritual teacher. Engaging in the spirit of the dance she has devoted her life to, making these masks will be, for me, also a devotional meditation for Tara, who is the female Bodhisattva of Compassion in Tibetan Buddhism. More on this later......there is far too much to say to write about Tara and Prema in passing. To share with fellow devotees a sacred invocation, a ritual dance, the creation of sacred and devotional art, can be transformative, a great blessing. Tara is celebrated with a long prayer called "The 21 Praises to Tara". The Goddess has 21 manifestations - peaceful and wrathful - all different expressions of divine mercy and wisdom. 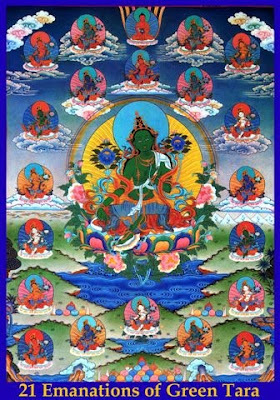 In the painting below, Tara is surrounded by smaller figures, each representing a different aspect of the Goddess (such as "White Tara", "Red Tara", etc.) 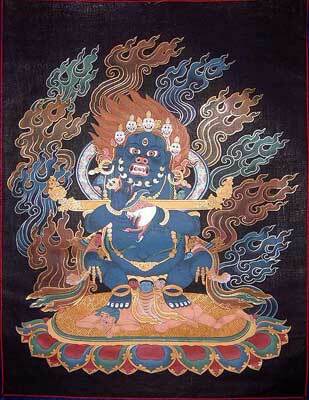 Black Tara is a wrathful manifestation, identical in form and, no doubt, source, to Hindu Kali. Like Kali, she has a headdress of grinning skulls, like Kali, she is black, like Kali she has three eyes. 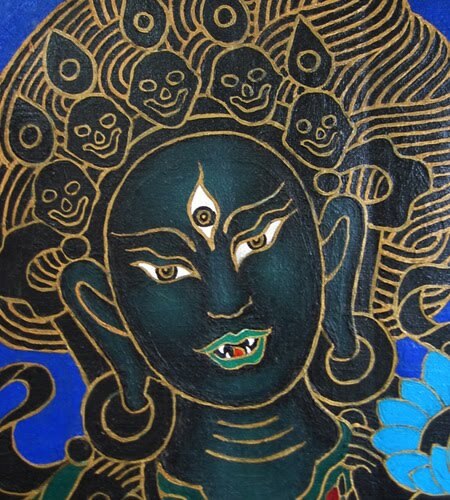 Like many Tibetan deities in the wrathful aspect, she has the fangs of a tiger, symbolizing ferocity, a ferocious appetite to devour the demons of the mind. Her aura or halo is fiery, energetic, full of smoke symbolizing the transformation of fire. Kali is the great Dark Mother of India. In Hindu mythology, when the world was being devoured by demons, there came a time when even the great Gods couldn't battle them. And so Kali the terrible manifested, the "last ditch savioress". Kali is the One who brings the forest fire, levelling the ground so new growth can occur, the surgeon who cuts cleanly away morbid tissue so flesh can heal. So, what can happen when we, even unconsciously, In-Voke a great Deity, an Archetypal Power.............a Goddess? Well, as I said, "if you build it, they will come". These things really shouldn't be done lightly. Tara has been my revered and mysterious divine teacher for many years. I won't presume to say I can understand a Goddess ......... their purposes being collective and far beyond my personal understanding..........but if I was going to make a tenuous statement, it would be when you call on a Goddess, She's not going to give you a polite reply that's been spell-checked. The ineffable work with us in the arena of energy, in the field of dreams and soul language. I stayed up all night, pacing the floor. The darkness and solitude was deafening. I walked around and around the block, yelling at the damn yapping ubiquitous dogs. Yelling at the walls. I pulled out cups and plates and shattered them around the house. (Pottery therapy can be very satisfying. White china is especially good.) I screamed at people who fortunately weren't there. I raged, I spit, I cried and wiped my nose on my shirt, I drank too much vodka, I looked in the mirror and called myself a lot of names. The sun came up, I drove around and around, and screamed some more (in my car), because I felt like I had no where to go. But finally, I looked up a friend. I didn't clean up the mess on the floor for several days. Visiting my friend, who is also having a hard time these days, sleeping on her couch, talking all the next night...........was more important. I thought it was worth keeping that pile of shattered pottery there for a while, a silent witness to the passing of a storm. How do I feel now? Actually, I feel great. And, I think I understand some things about myself, and my authentic needs, a lot better now. Black Tara, dancing Her tough love, crimson lips full of that vast, vast laughter. I am embarroused to find this worthy commentary about Kali in my files, and not the credits. I hope, should the author ever find me, he or she will accept my apology, and appreciation for the wise scholarship. Her three eyes represent past, present, and future, — the three modes of time — an attribute that lies in the very name Kali ('Kala' in Sanskrit means time). The eminent translator Sir John Woodroffe in Garland of Letters, writes, "Kali is so called because She devours Kala (Time) and then resumes Her own dark formlessness." Kali's proximity to cremation grounds where the five elements or "Pancha Mahabhuta" come together, and all worldly attachments are absolved, again point to the cycle of birth and death. " I was thinking lately about Serendipity, which is actually a vague word that I kind of.....maybe....understand, or.....contribute to its continuing creative evolution by using it..........or.......? Maybe it's kind of related to synchronicity? Or, kismet? I was thinking about how lives seem, sometimes, to be woven from random accidents. Here's an example. Back in 1975 I was living at an artists warehouse in Berkeley. It was almost Halloween, and we were planning our big bash. I had a date for the evening, and a costume. A little earlier, Paul and Peter from Ontario, Canada, had just graduated from college, and decided to have an adventure by driving across Canada in Paul's Volkswagen bug. They had gone through Vancouver, and were headed down the coast on their way to Mexico, their destination for the winter, until they headed back to Canada when the weather was friendly again. When they got to Berkeley, the engine blew up. In those days, if you were a counter culture type, and you had a Volkswagen, you pulled out your friendly counter-cultural volkswagon repair manual, and fixed it yourself. Taking a volkswagon to a mechanic was so "establishment". They even had do-it-yourself garages in Berkeley where one could rent space to work. While in Berkeley, Paul met a woman who invited him to a Halloween party; which is why he turned up wearing a large plastic garbage bag. His date, however, never turned up. Feeling dejected, Paul wandered around looking for someone to dance with, and found me. My date had also failed to turn up, and feeling equally dejected, I started dancing with the tall, skinny guy in the garbage bag. To make a long story shorter, Paul (and his friend Peter) stayed on in Berkeley. Peter met Belinda, got married, and had a child, Gabriel. Paul and I got married, moved to Wisconsin, and a few years later were amiably divorced. I moved to Vermont, and Paul met a woman there in Madison who he married, and they later moved to Austin. While still in California, Paul's sister Pat came out to visit me, and there she got a job as a nanny. 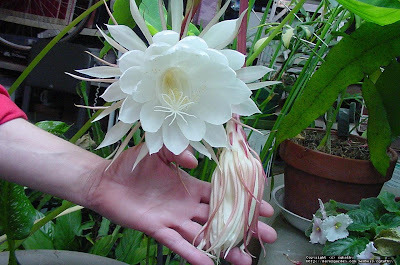 She lived in the Warehouse for a while, and met a man from Sri Lanka. They got married, moved back to his homeland, had 3 children, and Pat is still in Sri Lanka. Paul's brother, David, also came to visit, and ended up moving to San Francisco; he lives there still. None of them ever returned to Canada. All those children born, and careers begun. "Serendipity is the ability of making accidental but fortuitous discoveries, especially while looking for something entirely unrelated. The word has been voted as one of the ten English words that were hardest to translate in June 2004 by a British translation company. However, due to its sociological use, the word has been imported into many other languages." sustains us to the sea. In my previous post, I posed the question "how would we live, if rivers were also Goddesses? ", and this poem from Bali came to mind. The Balinese begin each day with an offering. I can't speak about beauty without making my own offering to Saraswati , the Hindu Goddess of the arts, truth., and language. She is often shown bearing writing tools and a musical instrument, tools for inspiration and truth speaking, which are inseparable. As the embodiment of speech, Saraswati is present wherever speech exists, but She represents the best in human culture: poetry, literature, sacred rituals, and truth-speaking between individuals. Even today, when a new baby arrives, grandmothers make a five pointed star - called "Saraswati-sign" - on the newborn's tongue with honey. The tongue, the organ of speech, is thus "hitched to Saraswati's star" early. When I was in Ubud, the Arts Capital of Bali, every morning and at twilight I beheld the stately procession of 5 white geese making their way up the busy street I lived on,. In the evening, heading back to whatever rice paddy they called home, they would make their return. Although people on motor scooters often went around them if they could, I was amazed at the utterly un-Western patience with which Balinese motorists followed behind the geese. They did not honk at them (although the geese certainly honked their own mysterious way up the street), nor did the Balinese try to shoo them out of the way. "The Sanskrit word sara means "essence" and swa means "self." Thus Saraswati means "the essence of the self." Goddess Saraswati is worshipped by all persons interested in knowledge, especially students, teachers, scholars, and scientists. I just recently took a brief trip to New Mexico, to see the subtle dance of spring spread over th0se vast, sun washed lands, and to renew, if only briefly, my acquaintance with the Rio, the Rio Grande, the "big river" that is not really a very big river at all, compared to the great rivers of the east. And yet, the Rio is the slender, turquoise, serpentine Goddess of those dry lands, bringing generous life to all the places she travels through on her long, miraculous journey. Not so long ago, and in many places still, all rivers were Goddesses (the Danube, the Nile, the Ganges, the mystical river of Saraswati)........how differently might we live in the world, when a river is also a Goddess? While travelling, this quote from Joseph Campbell came to mind. Especially while I travel, I often find myself remembering that the whole world can be a sacred space. That a picnic of sardines and rice cakes under a cottonwood tree, can be a sacred space. Or a sacred space can be a room, or even a table at the library if need be, a place apart. 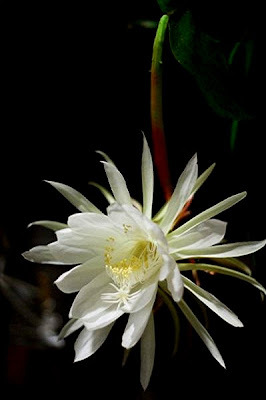 At last, the sacred place has to be the room of one's mind, the closing of doors, for a while at least, so that you find your feet "on the pollen path", so you open your eyes to see, as the Navajo chant goes, that Beauty is all around you. I have two young 10 year old friends who have what they call "beauty moments"; they will both wave their hands in the air in appreciation of anything that strikes them as beautiful, whether it's a bumble bee, or a painting, or a nice plate of lasagna. I love their aesthetic thank yous. How important it is to take the time to recognize and appreciate the sustaining power of the beautiful. Yesterday, I was delighted to see blankets of color, poppies, lupine, other wildflowers, dotting the brown landscapes I drove through. Stopping at a gas station, I stood behind a trucker who was actually complaining about having to wash the pollen off of his truck! "It's really bad", he was telling the cashier, "in Texas". "Bad!" I couldn't believe it! Apparently the fuming chrome of his diesel truck is the only beauty this man sees in the palette of spring. Such a weird, and sad, contrast to the mind of the Hopi, with their reverence for the Butterfly Woman, the Pollinator. Or the Navajo, who anoint girls when they come of age with yellow pollen, so they will walk in beauty on the "Pollen Path". How can we have so much, and yet be so ignorant about the sheer toxicity of our psychic environment? Even going into my favorite coffee shop, I put on my earplugs to block out the background of radio and commercials. I found myself soaking up the stillness of the Gila Wilderness yesterday like Chi, like Prana, like water when thirsty. In the silence, in the wilderness, you can hear the soft voice of your inner life, the voices of the conversant, synchonistic world, the inspiration of the Muses, the dream language of the soul. We need these places, these sacred places, whether they be a room or a canyon, to find our Selves. We also need the intention to make it so, to weave the cocoon, to cast the magic circle, to c0-create the exchange. 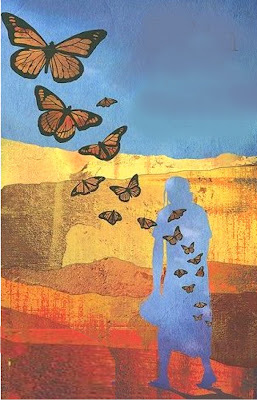 Then, emerging anew, we can also cast butterflies, dancing into the world. "Oh, beauty before me, beauty behind me,beauty to the right of me, beauty to the left of me, beauty above me, beauty below me, I’m on the pollen path." "SYNCHRONICITY: the coming together of inner and outer events in a way that can't be explained by cause and effect and that is meaningful to the observer. Or: meaningful coincidences." I wanted to introduce the work of new friends I've made in the Blogosphere, Rob and Trish MacGregor. They have a wonderful blog about synchronicity: http://ofscarabs.blogspot.com. and have been collecting stories of synchronicity for a forthcoming book, 7 Secrets of Synchronicity: Your Guide to Finding Meaning in Coincidences Big and Small. (http://www.synchrosecrets.com) The book is scheduled to be published in August 2010. "If you've found your way here, then it's likely you have experienced meaningful coincidences - what psychologist Carl Jung called synchronicity. Here, we explore the phenomenon in depth and invite all of you to participate. If you have synchronicity stories you would like to share, drop us a note at macs@synchrosecrets.com. " The Macgregors write about their book, "In February 2009 , we started a blog - www.ofscarabs.blogspot.com as a research tool for writing a book on synchronicity and gathering stories about the phenomena. It was our first experience at blogging and we weren't sure how the process worked or what the response would be. The first week, we got 38 hits - mostly from friends and family. So we set up a Google alert for "synchronicity" and began sifting through dozens of links the blogs and sites that filled our inbox each day. When we found genuine synchronicities, we left comments and invited people to share their stories on our blog. By June when we sold the book - 7 Secrets of Synchronicity: Your Guide to Finding Meaning in Coincidences Big and Small - we had more than 7,500 hits. Before the blog's year anniversary, we had nearly 50,000 hits and had collected hundreds of powerful stories about synchronicity." I've always been fascinated with synchronicities, and have made an effort to record their occurrence in my own life. Ever since I took on my Spider Woman Project, synchronicities have abounded - I've come to think of them as a thread the master Weaver throws my way, here and there, just to keep me awake. A funny one is on view below - it occurred in 2008 when I parked in Midland, MI, to get a cup of coffee, enroute to view the show of "Spider Woman's Hands", a community art project, at the Creative Spirit Center there. I had initiated the project in 2007, but they completed it that spring without me. Participant panels went around the wall, the thread held in each Icon's hands being passed to the next, and finally disappearing out the door. This, I like to think, was Spider woman's whimsical approval for our efforts on Her behalf. I look forward to the book, and my congratulations to the MacGregors for their dedicated and fascinating work!